Monaghan ran out comfortable winners in Páirc Tailteann. Monaghan complete the line-up for the new Super 8s series after shrugging off Laois in Navan to keep their hopes of a breakthrough All-Ireland semi-final place intact. Malachy O'Rourke's side, who came into the contest with momentum after beating Leitrim and Waterford, were a cut above the beaten Leinster finalists throughout and will play Kildare at Croke Park next Sunday. Conor McManus top scored with five points and while Monaghan failed to register a goal that was chiefly down to the brilliance of Laois 'keeper Graham Brody who pulled off six outstanding saves. That was about the only bright spot for Laois who fell five points behind after a slow start and never got closer to Monaghan than four points after that. 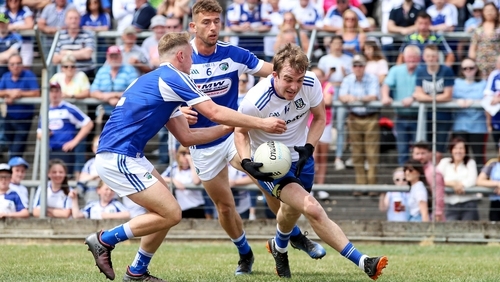 They found Monaghan's counter attacking system difficult to penetrate and struggled to supply quality ball to their big full-forward Donie Kingston. Monaghan will take their place in Group 1 of the Super 8s alongside Kerry, Galway and the Lilies with a glamour home tie against Kerry in Round 2 the pick of their ties. It was Monaghan's third straight qualifier win over Division 4 opposition having been eliminated from the Ulster championship by Fermanagh. A gulf in quality was evident too with Monaghan finding scores much easier to come by and creating them by various means. Shane Carey, Jack McCarron and McManus all helped themselves to scores in the first-half as Laois found their defence under siege. Karl O'Connell, nominally a Monaghan wing-back, featured prominently in attack and curled over two eye catching scores with the outside of his right boot. Laois, in contrast, had to fight so hard for any score they got and trailed by 0-07 to 0-01 after 16 minutes. Their first point from play didn't arrive until the 24th minute and even then Evan O'Carroll had to conjure a clever dummy to get clear of his man. Monaghan defended with 15 behind the ball at times but had the guile and quality to launch a number of sumptuous counter-attacks which troubled Laois. Two things gave Laois hope; Brody's performance in goals and a goal that they scored through Paul Kingston approaching half-time. Kingston was guilty of over elaborating and wasting two earlier point opportunities but shook off Fintan Kelly this time before blasting low past Rory Beggan. As for Brody, he pulled off three great saves in one-on-one scenarios, firstly from Kelly, then Ryan McAnespie and finally Conor McCarthy. Monaghan still went in at the break with a double scores advantage, 0-14 to 1-04, and already appeared to have one foot in the Super 8s. Laois improved in the second-half and outscored Monaghan by 0-07 to 0-05 in that period but, again, were bailed out by Brody who pulled off three more excellent saves. O'Carroll added to his tally with two more points and punched the air in delight on each occasion but those scores couldn't inspire the O'Moore Men to a famous comeback win. Monaghan picked off enough scores from McManus, Paudie McKenna and Ryan McAnespie, who scored two fine points in the last quarter, to keep their noses well in front throughout the half. Monaghan: Rory Beggan (0-02, 0-01f, 0-01 45); Kieran Duffy, Drew Wylie, Ryan Wylie; Fintan Kelly (0-01), Vinny Corey, Colin Walshe; Niall Kearns (0-01), Darren Hughes; Ryan McAnespie (0-02), Shane Carey (0-03), Karl O'Connell (0-02); Conor McCarthy (0-01), Jack McCarron (0-01), Conor McManus (0-05, 0-02f). Subs: Dessie Ward for Walshe (31-32), Dessie Money for Corey (48), Paudie McKenna (0-01) for Kelly (48), Kieran Hughes for McCarron (52), Conor Boyle for Walshe (57), Neil McAdam for D Hughes (63), Dermot Malone for Carey (70). Laois: Graham Brody; Gareth Dillon, Mark Timmons, Damien O'Connor; Trevor Collins, Colm Begley (0-01), Darren Strong; John O'Loughlin, Kieran Lillis; Alan Farrell, Paul Kingston (1-00), Bran Glynn; Ross Munnelly (0-03, 0-03f), Donie Kingston (0-03, 0-02f), Evan O'Carroll (0-04, 0-01f). Subs: Benny Carroll for Farrell (h/t), Finbarr Crowley for O'Loughlin (42), Niall Donoher for Glynn (46), Eoin Lowry for P Kingston (50), Shane Nerney for Strong (61), Gary Walsh for Munnelly (68).